Full Description: A copy of the British Museum’s “Instructions for performing on Wheatstone’s Patent Duett Concertina”, c1850, which is on-line in full at http://www.concertina.com/duett/#duett-wheatstone-tutor There are four Wheatstone Duett concertinas in the Collection: Items C.094 , C.095 , C.096 and C.097 . 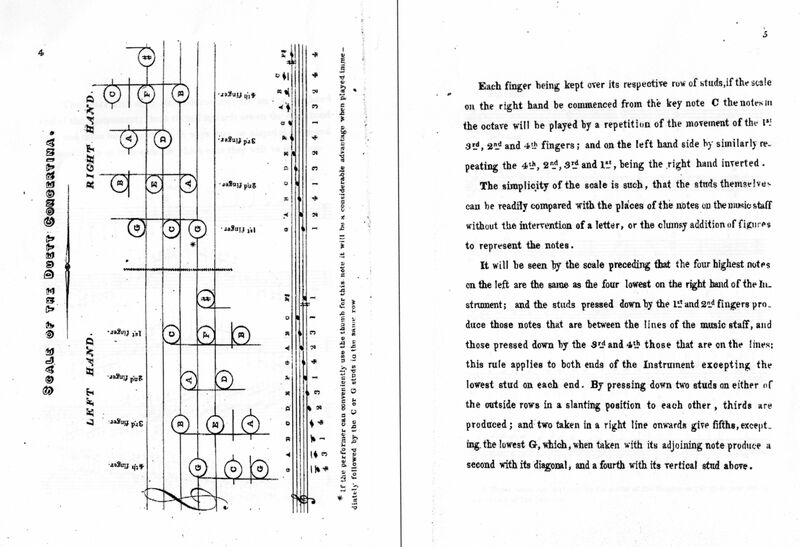 Robert Gaskins’ notes from the concertina.com site state – “Wheatstone's early “duett” concertinas look very much like early Anglo-German instruments, but with different internal construction and a true "duet" arrangement where each button plays the same note on both push and pull. The keyboard is identical to the central notes of the later Maccann Duet Concertina, and anyone who can play a Maccann can pick up a Wheatstone Duett and play immediately in the keys of C or G.
The Wheatstone tutor for this instrument (reproduced in full http://www.concertina.com/duett/#duett-wheatstone-tutor here) was deposited at the British Museum on 28 July 1855, and was probably published after 1850 (the previous large deposit of Wheatstone publications). In addition to the tutor, Wheatstone & Co. published twelve books of music for the 24-key duett, all carefully noted in the keys of C and G only (of necessity). The first six books were stamped at the British Museum 28JY55, at the same time the tutor was accessioned. 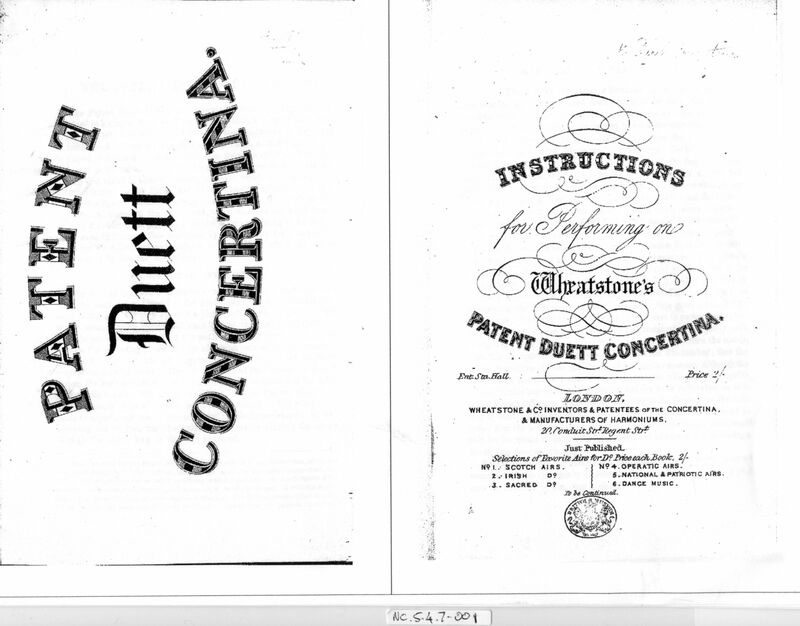 Then the next four books were stamped 21DE59, with a new title page as well listing more music for duett. The last two books were stamped 16AP62. 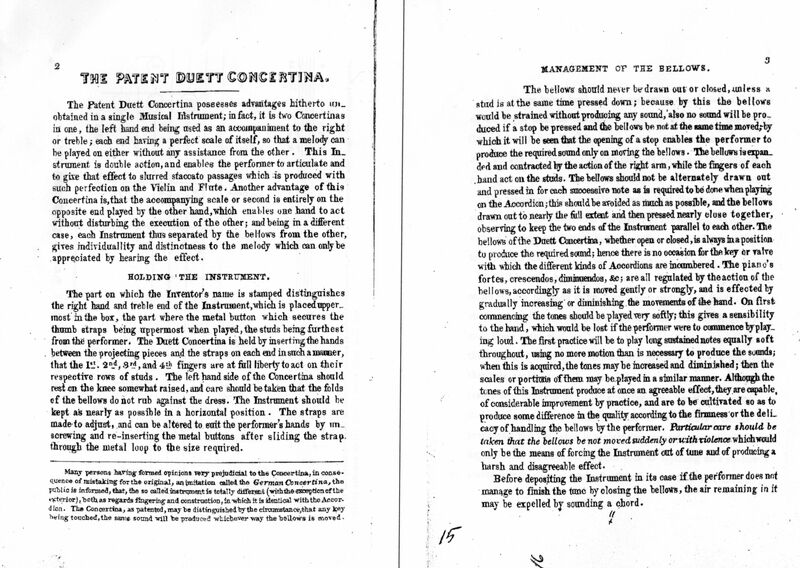 The earliest known advertisement was placed in The Scotsman (Edinburgh) on Wednesday, 20 December 1854, offering (along with conventional English concertinas) "The Duet Concertina" in mahogany and rosewood, together with its tutor (this was seven months before the tutor was date-stamped at the British Museum). Fifteen months later a longer advertisement by Wheatstone was appearing in the Daily News (London), with the earliest of these found so far in the issue for Thursday, 13 March, 1856, offering the “novel” duett concertina for sale, along with the “tutor and seven books of airs”.